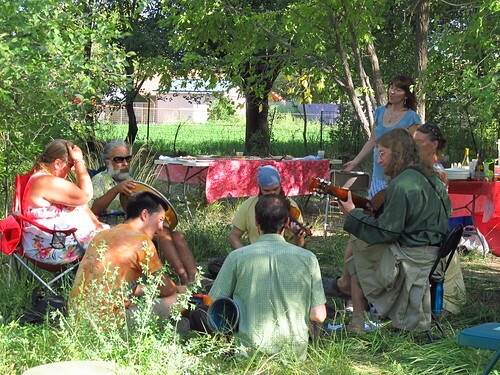 Sunflower River is a working farm, and center for pagan (earth-based) spirituality. We live and act in both of those spaces simultaneously. 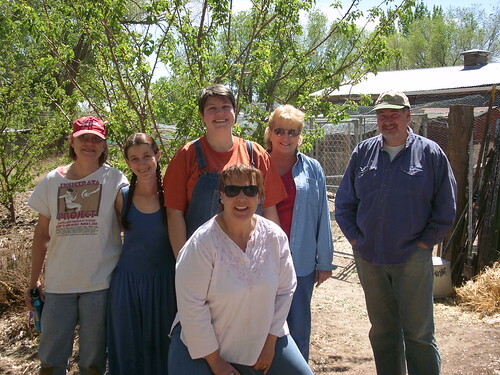 So we maintain a large garden, raise livestock, preserve food, host ceremonies large and small, host a few secular events, and we’ve always got a project or three going on. Sunflower River was founded in 2007 by Tristan, Jenny, Kat & Alan. Billy has been part of the team from the start, and Rev joined in 2008. We have been building infrastructure (organizationally, interpersonally, and literally) nearly every day since we started. Lots of processes and projects are highly functional now, others are just getting going, and others are yet to be realized. No one has ever accused us of insufficient ambition! So the things we do fall under three main categories: Cycles, Events and Projects. We maintain a quarter-acre organic vegetable garden, where we grow an assortment of chard, kale, lettuces and other greens, tomatoes, corn, eggplant, peppers, beans (dry and green), amaranth, peas, onions, garlic, potatoes, sunberries and whatever else comes to mind in a given year. 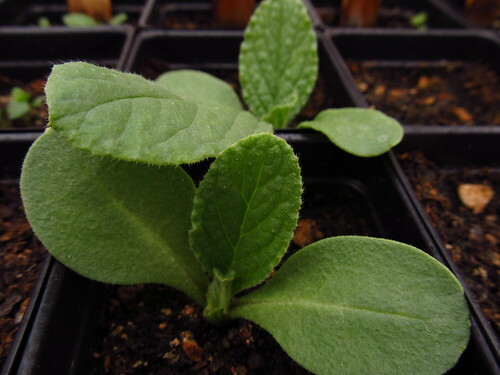 We grow the vast majority of our plants from seed, either through direct-sowing, or through starting seeds in our greenhouse, and we use organic heirloom variety seeds, which we acquire mostly from the Seed Saver’s Exchange, or through our own and others’ seed-saving efforts from year to year. While we are not producing enough surplus food to support a CSA operation, or farmers’ market sales, we do manage to put a significant dent in our own grocery budget through our food production and preservation efforts. 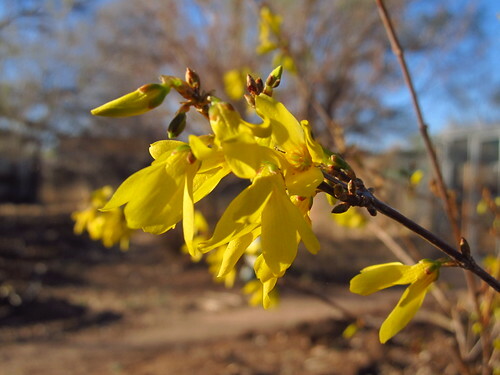 Pollinator-friendly shrubs and herbs surround most of our garden areas, and one entire set of gardens, the Dye Beds, are devoted to pollinator-friendly plants. We interplant borage and other pollinator-friendly herbs in the main vegetable garden to attract beneficial insects and create habitat. For the most part, all one has to do to have beneficial insect species around is to create a place for them to live. And of course, the flowers are beautiful, and that’s a good reason in its own right for them to be there. 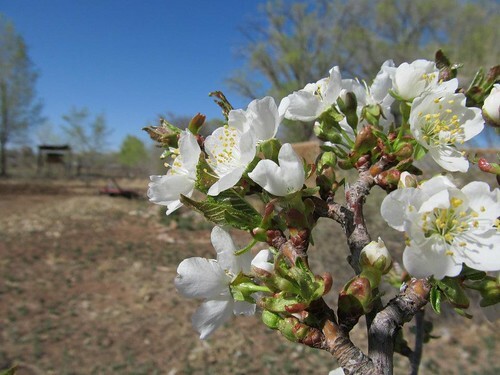 We also grow a variety of medicinal and culinary herbs in the Mint Bed, the Herb Garden, and the main garden, in addition to the ones that grow wild on the property, such as yerba mansa and globemallow. 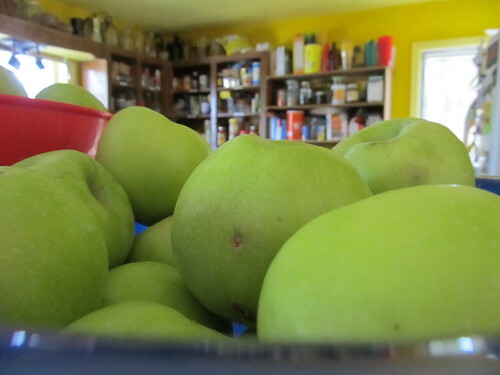 We preserve as much of our harvest as we can, to help us keep eating home-produced food through the winter. One thing this does is put us in touch with our ancestors, who, as recently as two generations ago, lived in a world where most people were primary producers, growing food, preserving food, sewing their own clothes, etc. We inherited a world that has moved very far away from the primary means of production, to the detriment of our collective skills, understanding, and creativity. At Sunflower River, we are interested in being a site of primary production, rather than consumption, of our material culture. One of our major harvest activities is food preservation, through canning, freezing, and drying, of fruits, vegetables, herbs, and meats. Canning is easily the thing we do the most of. 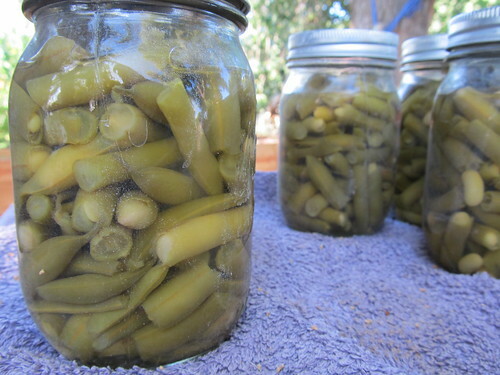 Most years, we put up apricots, green beans, tomatoes, apples, assorted sauces, many kinds of jam, and pickles (cucumber & green bean pickles in particular). We’ve had assorted adventures in food dehydration over the years. You’d think that would be easy here, but harvest season is also monsoon season, and it’s also Insects Eat Everything season, so solar screen dehydrators have to somehow be exposed to the sun, protected from the weather, and seriously protect the food against insect encroachments. 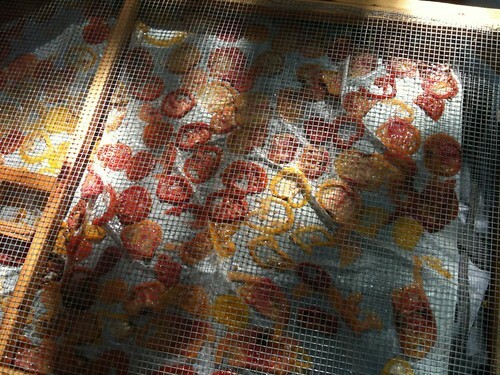 This year we ended up drying a lot of tomatoes in the oven. A technical, rather than passive, solution, but effective, and now we are eating a lot of delicious dried heirloom tomatoes, packed with flavor. Some day we hope to get around to building a box-o-foil style solar dryer — or having an intern who feels inspired to make one! Meanwhile, Kat is planning to try out a tip from Mother Earth News next summer, and put the screen dehydrator in the back seat of one of our cars, where it is protected from insects and about a thousand degrees during the day. We are also brewers. We make mead (honey-wine, usually also made with fruit), and sometimes hard cider, and old school ginger ale. We plan to expand into beer production at some point, though it lacks the primary advantage of mead, which is that you can ignore mead for several months while it is brewing, and this neglect will not harm it. In addition to being traditional, easy to brew, fun, and flavorful, mead tends to have a high alcohol content. 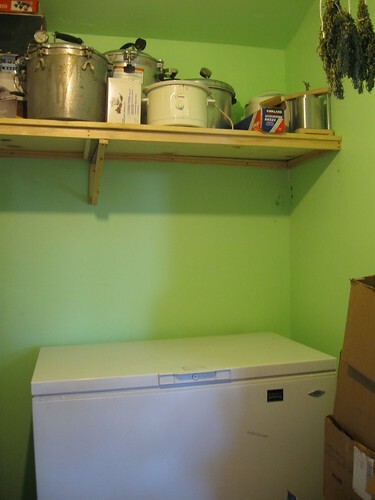 Since we are not focused on reducing our technology level, so much as applying appropriate technology in our lives, we also have a couple of chest freezers, in which we store the meat we produce, and any fruit and veggie harvests that we don’t have time to can or dry. It’s not as romantic, or photogenic, as more antique methods, but it sure is a good solution to suddenly finding yourself with 25 chickens to process. Sunflower River raises chickens and turkeys. We keep a flock of laying hens for eggs, a pet peacock for pest control (and beauty! 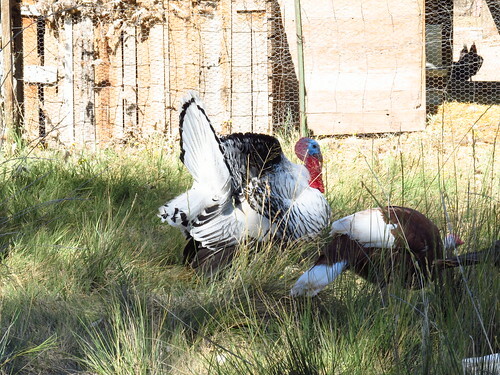 ), and we raise both chickens & turkeys for meat. Our birds are kept cage free, in large open pens, where they have abundant space to run around, perches, nesting boxes, and playgrounds made of bent cottonwood branches and pallets. They are permitted to freely range the property whenever someone is home to make sure they stay out of trouble (and the lettuce beds). 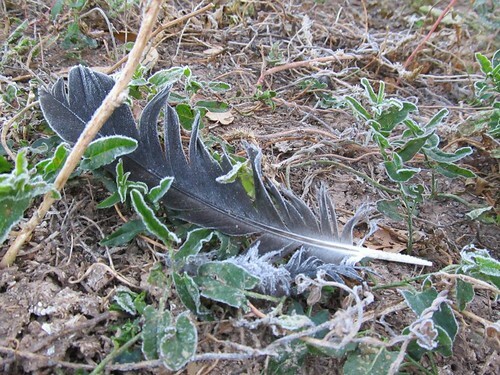 Since the peacock does not scratch in the garden (thereby uprooting young plants, the way chickens do), they are fully free-range at all times. The poultry is part of an integrated farm system. 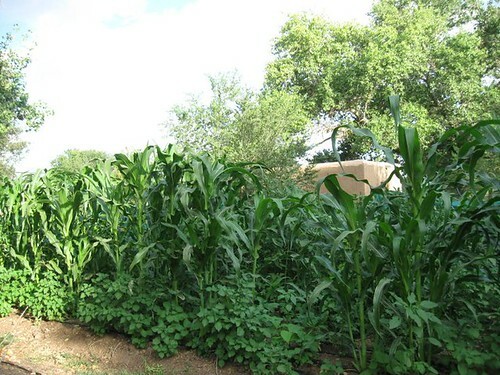 Their manure is re-used in the garden and fields to enrich the soil, they eat insects that harm our crops, and they provide meat and eggs for our table. We process our own chickens and turkeys. At present, we are raising about 50 meat chickens and 40 turkeys each year. We process our own meat on site, using the cone method. We begin each animal processing day with a ceremony to honor the spirits of the animals, and then use methods as swift and humane as possible to do the work. These work days are open to others; we are happy to teach this process. For fuller details, and a detailed account of our philosophical interest in this process, please see the animal processing entries on our blog, and this article. 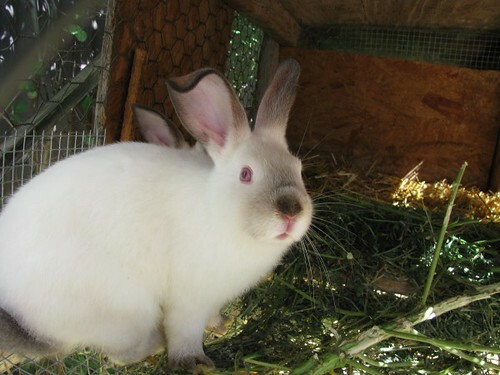 We have also raised meat rabbits, specifically Californians & new Zealands, though we are not currently doing so, and do not have a plan for it at this time. We originally acquired rabbits in a rather impulsive manner, responding to someone who needed to get rid of a set of meat rabbits in a hurry. We scrambled to create adequate housing, before we had really done adequate research, and ended up making an open pen with two sections, for males & females. Then it turned out all five does were pregnant. Instant adventures in baby bunnies! Then they all got out and ate a 50′ row of beans in the garden in about fifteen minutes. We *did* successfully recapture them. We lined the pens with chicken wire on the ground. Then random dogs, easily the worst predator in our area, broke into the pen and killed most of our flock. One mama and two kits survived, by hiding inside the pallet upon which their feeder had been sitting. From these two kits, dubbed Touchable and Untouchable, we rebuilt our first rabbit flock. 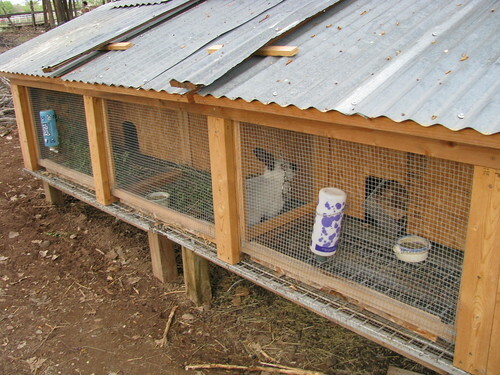 We also re-designed the rabbit hutches, going at first to conventional raised cages, and then to the fabulously engineered system we use today, developed by Tristan & Rev, which includes a 3’x3′ space for each rabbit, with an interior and exterior portion of each condo, screen walls in between that allow the rabbits social contact without unauthorized intimate congrees, an automated feeder system, and lots of head-room for the bunnies to stand up in. The new cages are also raised, for easy cleaning, and feature lids with a counter-weight that keeps them balanced while we do care and maintenance tasks. Since we stopped raising rabbits, we’ve used these pens to brood baby birds, which has worked really well for us. One of these days, we are going to start a dairy herd. We want to get Nubian, or Nubian-Saanen cross, doelings. We are taking our time building infrastructure, having learned our lesson from our early adventures in rabbit ownership: build appropriate housing arrangements before you get the animals! We have a good-sized goat pen, a goat shed for them to sleep in, and a feed trough. We have yet to create a milking stanchion, nor to finish installing the pasture fences (yes, we do know how important that is), nor to install a dairy-sink and cupboard in the barn. And of course, there will be no goats until there is a good fence, and at this point, the good fence is a year or two away. The plan (after fencing!) 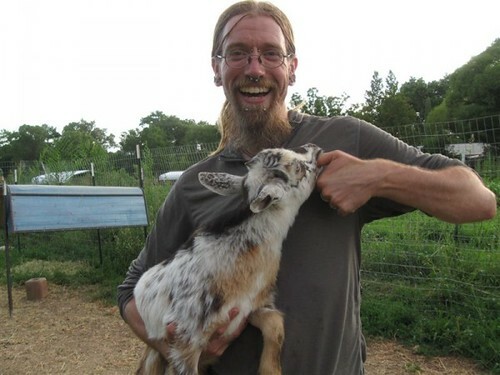 is to acquire two baby doelings, and finish with the dairy infrastructure while they are too young to milk, while in the meantime we get used to the fact of goat-ownership and the things that will do to our morning and evening chores. Given the farm’s current priority stack, it’s unlikely that we’ll get goats anytime in the next year or two, but they remain part of our long-range planning. Currently, we are offering two poultry processing workshops every year, in July & October. These classes are hands-on, and designed to teach you how to process your own poultry from live bird to ready-for-the-oven, including a detailed, informative, hands-on approach to every step of the process. After completing this class, you will be able to process your own backyard poultry. Many people are drawn to this work for a variety of reasons — because they are raising their own chickens or other poultry, or because they want to learn to have a personal relationship with a meat animal, and engage with this ancient process on a very human level. We also offer a class called Community Tools, taught by Tristan, which covers consensus process, as well as our various project management and decision making and facilitation tools. This is a very useful class for anybody who works with a collaborative group, whether that group is at work, in your community, or as part of an intentional-community process. This class will be offered again in August. To hear about our workshops and classes, please sign up for our mailing list! 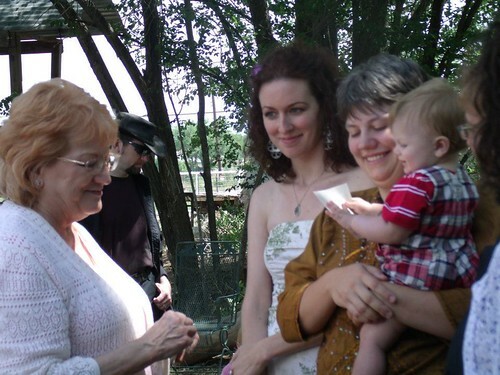 In the past, Jenny has taught one-day hands-on classes on cheese-making, canning, and drip irrigation systems. If there’s something you’d like to see us offer, please let us know! We host monthly Work Parties, during which everyone is welcome to come join us in whatever farm project is taking our focus at the moment. 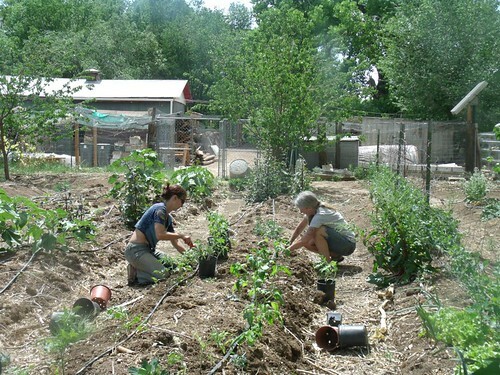 Work parties may focus on anything from canning, to earthbag wall building, to animal harvest, to tilling & planting the garden, or any number of other things. Work is varied, and there are always multiple small projects that need to be done as well as whatever large project is that day’s agenda. We can always use a hand with lunch preparation and childcare as well. We provide a hearty vegetarian lunch for all volunteers, and send everyone home with farm goods such as jam or eggs. The Sunflower River Harvest Festival is an annual celebration occurring on Labor Day (on the Monday of Labor Day itself). It includes a large community gathering, with a potluck, a pie contest, harvest games such as apple bobbing and horseshoes, an open acoustic music jam, and whatever other diversions people bring to the day. 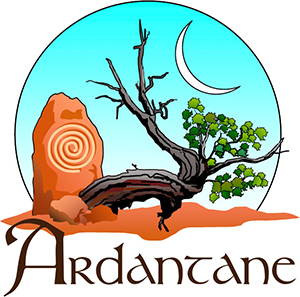 Sunflower River is an affiliate of Ardantane Pagan Learning Center. We are one of their Albuquerque-area campuses, and an assortment of Ardantane classes are held at SR throughout the year. See their Class Schedule for details. (This event is currently on hold, and may not be offered in 2019.) For many years, we have hosted a Spring Equinox ceremony in March (the Spring Equinox holiday is called Ostara among the pagan community). This event celebrates the onrushing springtime, and the balance of light and dark, day and night, as the Earth is poised on its axis. Traditionally, this event is led by the reigning May Queen & King of the local pagan community, chosen the previous year at Beltane. It is also a potluck (what pagan event is ever not a potluck, really? ), and a great time to mingle, meet and catch up with people after the ceremony, and can be a good introduction to paganism. 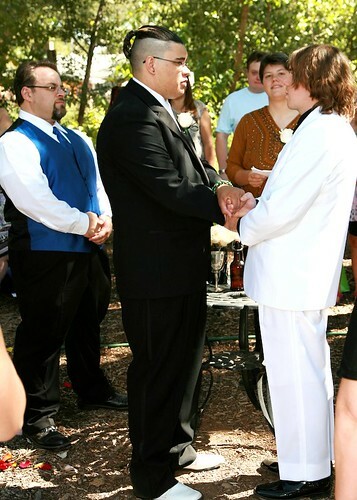 Sunflower River has hosted two handfasting (pagan wedding or commitment) ceremonies: Kat & Alan, in 2009, and Saint & Chance, in 2012. 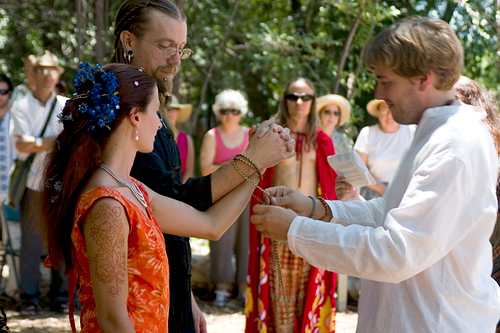 We are also available to host other kinds of pagan ceremonies, as needed. This photograph is from Gawain’s Wiccaning. In June of 2010, we undertook the process of building over 300 linear feet of earthbag wall, 6′ high. We have learned a heck of a lot about earthbag building in the process! Learning as we went, we began with a stretch of wall along our northern boundary, west of the compost, and proceeded east in a sinuous line until we reached the corner, where we created a sound-absorbing apse, and then we built the wall along the eastern, road-side, boundary of our property. 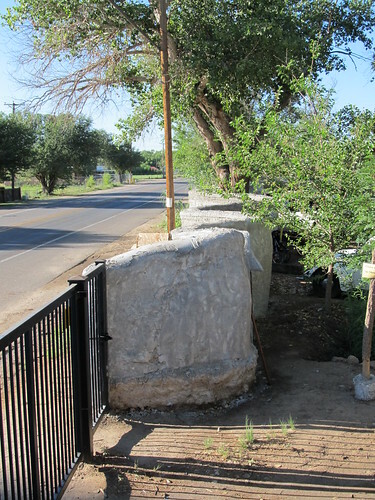 The purpose of the wall is for visual privacy, security, and to reduce noise from the busy road upon which our property is located. Construction of the north and east wall completed in 2014, and we are now adding an extension to the east wall in front of Mahazda. Only 15′ left to finish the whole thing, and we’ll complete it this year. We’re also in the process of adding a sculptural layer to the interior surface. 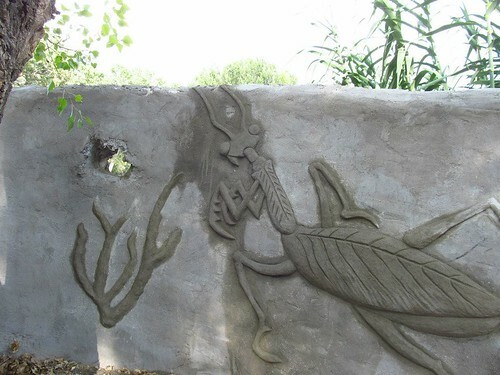 When that is finished, we will limewash the wall with an earthen colorant for the final weatherproofing. 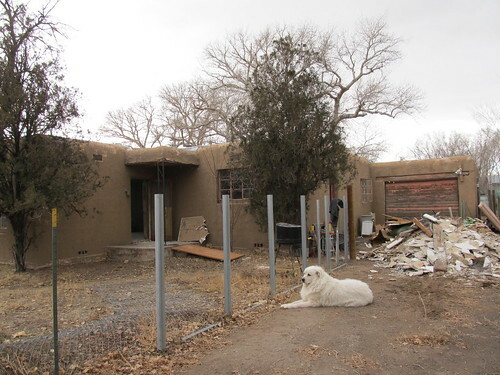 In Fall 2012, we began work on the next-door fixer-upper that we purchased earlier that year. We gutted the house over the following year, so that we can fully re-envision it to suit our community’s needs. Over the course of the next year, we remodelled the space to suit that vision. In November of 2014, we moved in. Though projects abound, we are delighted with the functionality and beauty of Mahazda as our community space. We host events, classes, and our community meetings here.